Admission: $65, $50, $30, $27.50. The Philharmonic’s more intimate concert of the season features music for harp. Haven’t you always been fascinated watching the harpist’s fingers dance around all those strings and wondered about those seven pedals? This evening we will present two of the most famous pieces in the harp repertoire, Maurice Ravel’s Introduction and Allegro and Claude Debussy’s sensuous Dances Sacred and Profane. Our soloist is our very own Cheryl Dungan Cunningham. Cheryl is one of this area’s most respected and in-demand musicians. She has performed at Carnegie Hall, the Kimmel Center, and Academy of Music, as well as in important venues throughout the United States and Canada. 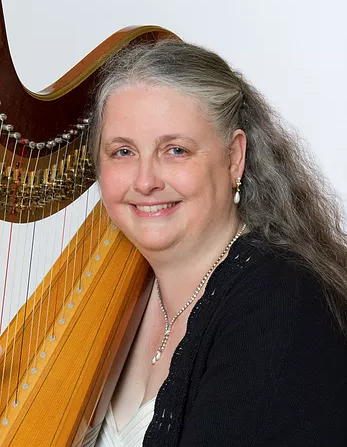 She has been soloist with several area orchestras and performs as principal harpist with a number of orchestras in the Philadelphia area, including the Capital Philharmonic. Cheryl can also be heard on several CD recordings. Completing the program will be works by Handel, Vaughn Williams, and Gustav Holst’s extremely popular Saint Paul’s Suite. A festive reception with wine and light snacks on the Patriots Theater stage follows the performance.